Having a great bath brush can elevate the experience of cleaning, from a necessity to luxury. The key to a good shower brush is good quality natural bristles and a handle long enough to reach down your back and is comfortable to hold. We’ve reviewed lots of brushes on the market to come up with this short list of the best brushes we could find. 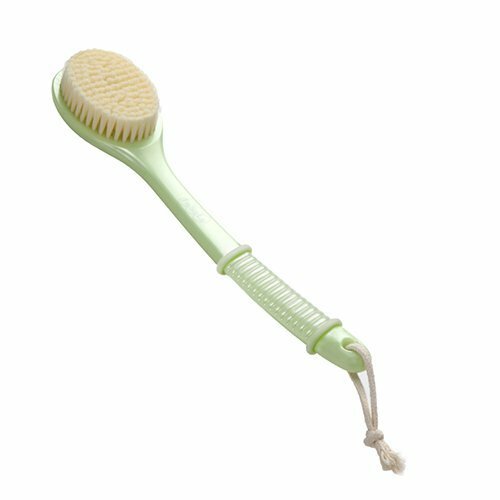 Based on our findings, the Janrely Natural Bristles Back Scrubber came out as our top recommendation. Below are the most important features that we looked to pick the top bath brushes. Handle shape and length – most brushes are either long and straight or shorter and curved. Both options will allow you to reach your whole back but most people find that it is more comfortable to do so with the curved handled brushes. 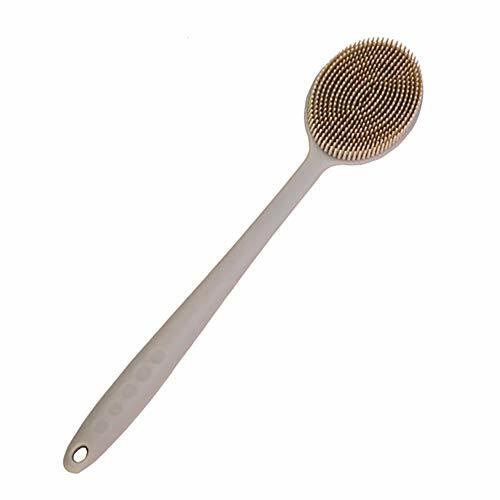 This back-scrubbing brush has a clean and simple design that makes it very aesthetically pleasing, so it certainly won’t bring down the tone of your bathroom. It works well as both a dry and a wet brush, however, the handle can become a little hard to grip in the shower, especially if you have soap on your hands. The biggest advantage of this particular brush is that the head is a really good size. That means that it covers a lot of skin surface with each stroke, the handle is a reasonable length and should be long enough for most people, although if back is especially long you may find that you need to switch you grip, from over, to under the shoulder so that you can reach every last spot. Most people will find that the bristles are nice and firm, just about right for exfoliating while in the shower or bathtub or even as good brush for dry brushing. When this product first arrives, you may find that a fair number of bristles shed, so you will have to give it a bit of attention before you first use it. If not cared for you may find that the bristles do continue to shed, so make a point of hanging it from the showerhead to dry between uses when used as a wet brush in the shower. This bath brush is something of a ‘love it or hate it’ product. If you have sensitive skin then the softer bristles are definitely a plus, however, if your skin is not so delicate, you may find that the softness just isn’t enough to leave you feeling like you’ve had a good scrub. One of the big selling points is the dual function head. We all like to feel as if we’re getting good value for our money so a long handle bath brush that doubles up as a massager feels like a good buy. A word of caution though, the massage side is only a bonus if it is something you will actually use. The brush is made of natural boar bristle. This means that when you first receive it, there may be an odor to the brush. After a few uses, the smell should fade. It can be a little off-putting if you are not expecting it. As with the other wooden handled brush, you do need to care that you dry this brush properly after using it. If you allow it to get soaked in the bath you may find that it begins to crack and grow mold. If you shake the water off and hang it to dry between uses, you shouldn’t have any problem though. This bath brush is a little different than the other two options as it is a plastic based brush. The upside to this is that you don’t have the worries about the moisture damaging the brush or leading to mold. The downside is that the brush is just not as pleasing to the eye and feels cheaper (which it is!). The bristles on this brush are really soft, so if that is what you prefer then this would actually be the best choice for you. The soft bristles do mean that this brush ends its self to everyday use well. The handle is shorter than other bath brushes, but the fact that it is curved does actually compensate for that, as it allows you to reach your back more easily. The curve also makes it easier to control the level of pressure you are scrubbing with. This Bath Blossom bath brush features a long handle – 17.5 inches long. It also has two bristle sides, one softer than the other. This means you can reach all areas of your back, legs, and other difficult spots. It is made of high-quality bamboo, which means it’s durable and sturdy – you can use it every day. Dry brushing can also be an alternative use for this product. 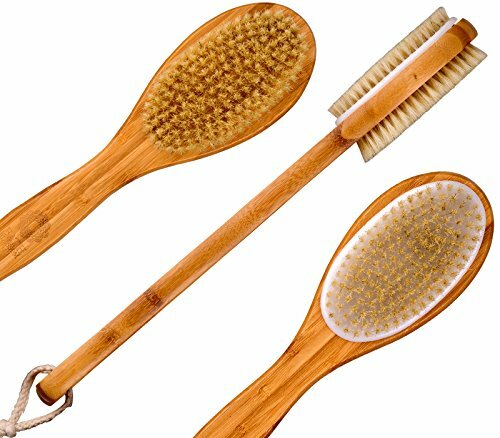 It has been studied that dry brushing can help boost circulation and enhance skin health. It’s great for a skin massage, too. Aside from that, using it in-shower can help exfoliate your skin. Simply use it with your preferred body soap or scrub. After using, simply rinse the brush and hang it on its rope so that it can dry before the next use. 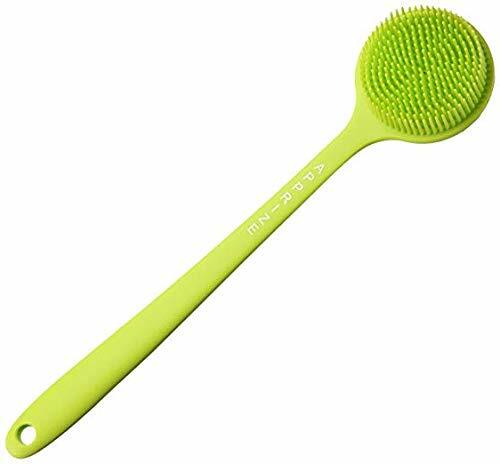 The Apprize silicone back scrubber is designed to provide ease of use and convenience. You can reach different spots of the body easily. Because of its ergonomic design and high-quality material, it is poised to last a very long time. Don’t worry about hurting the planet – its materials are all eco-friendly and safe for you. The brush is 14.8 inches long – the perfect body brush size. Plus, it is lightweight and doesn’t cause strain during use. The product is free from BPA (Bisphenol A), which is a dangerous chemical that can cause a number of harmful things to the body. This brush is completely safe, so you never have to worry. Use it to cleanse and exfoliate your body in the shower or during baths. 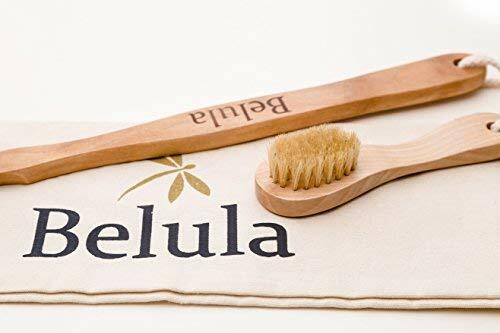 This body brush set from Belula is designed primarily for dry brushing. It has a long handle which is detachable. You can use it as you see fit, and it can help reach all areas of the body. It comes with an elastic strap that gives a nice, firm grip of the handle while using it. The wild boar bristles offer a firm and effective brush, giving you a nice exfoliation every time. You can modify the strength of your brushes to meet your needs. Make sure you only brush until the skin turns pink – don’t brush too hard that the skin turns red. The brush can help you get some stress relief. After a nice brush, you’ll feel much better. It can cause calmness and relaxation. That’s why many people use it after a long day at work. 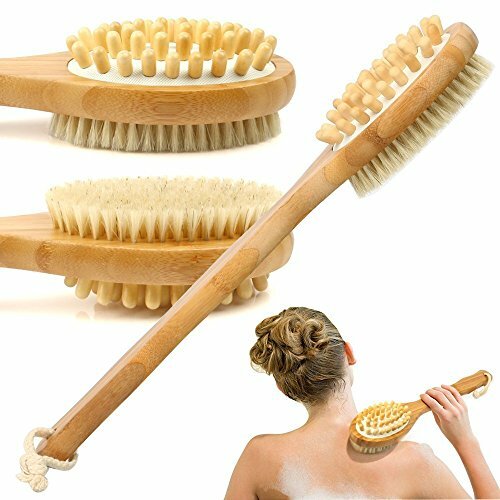 Dry brushing can also boost normal blood circulation throughout the body, as well as help in regulating normal lymph flow – which attributes to a stronger immune system. Lots of users do dry brushing daily and try to reduce cellulite. It also helps in clearing the skin of dirt, oil, and other pollutants. Overall, dry brushing is a nice way to achieve healthier skin, because it exfoliates dead skin cells, it creates a nice and natural glow, and it also provides some semblance of relaxation from the massaging motion. This bath body brush is safe for all skin types, even sensitive ones. It can be used by men, women, and the entire family. It is moderately sized, with a 10.82-inch handle. It can get the job done, so if you aren’t looking for an overly long brush handle, then this is a great choice for you. You can still reach commonly hard-to-reach areas with ease. It has a hook at the end, which makes storage and drying a lot easier after use. You can also find comfort in knowing that it is designed so that no residue is left on the brush, which can be a cause of germ build-up. This is a must-have for all fans of using brushed during baths and showers because it cleanses the body more effectively than you would with just your hands. The brush is made of silicone, which is comfortable to use – and it does not cause any strain while handling it. All of the parts used in making this brush is made of 100% BPA-free materials. It’s completely safe to use, and you never have to worry about transferring harmful chemicals to your skin while using it. 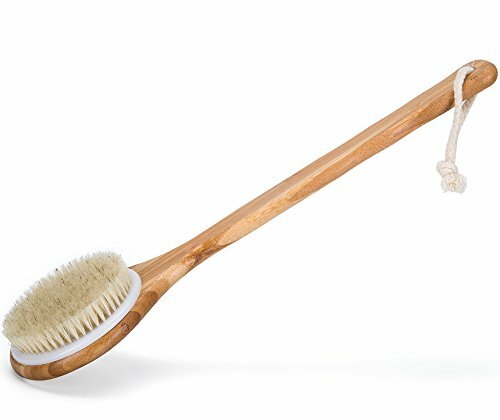 The nicely firm bristles along with the pleasing look of the brush are what helped to catapult the Janrely Natural Bristles Back Scrubber to the top of my list. The firm, natural bristles give it the bonus of being usable for dry brushing as well. The other brushes are great choices if you prefer a softer feel to your brush but for me, they just don’t scratch that itch in the same way. Suction Grab Bar for Shower Safety | Are Suction Cups the Best Solution?